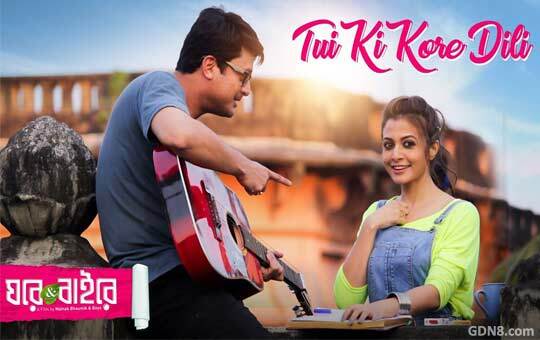 Tui Ki Kore Dili Lyrics from Ghare And Baire Movie The song is sung by Anupam Roy Starring: Jisshu Sengupta and Koel Mallick Ghore & Baire Bengali Movie Directed by Mainak Bhaumik. চান খাওয়া নেই, চুল গুলোতে ..
ঠোঁটে আনা যেতে পারে ..
News about Tui Ki Kore Dili Song Lyrics: Great news for all "Anupam Roy" lovers, He is come with his brand new and fresh Bengali song from Ghore and Baire Bengali Movie. The lover boy Jisshu Sengupta And sweet cute Koel Mallick is the starring Main Lead Role In This Movie.